I need a quote, will you quote for me? For fabricating correct PCBs to meet your project need, we can not quote for you. Because there is not standard PCB features in PCB industry and we can not decide what PCB features you need, so you are the person to select your PCB specification when you quote online. (All your selection will affect the quote price. You can quote as many times as you like until you get the idea quote for you). Please be advised that my company will fabricate PCBs only according to the quote specification you paid, not any descriptions in any other place. Without registration and log in, you can get your PCB fabrication setup fee, each PCB fabrication cost and the total PCB fabrication cost, but you can not get the complete quotation, terms and the quote ID, so you can not order your PCBs. If you register and log into our website, you can quote your PCB fabrication project to get the complete quotation and the Quote ID. With the Quote ID, you can place your order on line very easily. 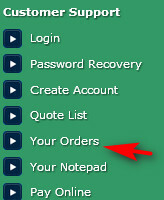 And you can use your Quote ID to track your order until you receive the PCBs. How to quote my previous order PCBs to save Setup (1st Time Only NRE) Fee? 1. Log in our website www.PCBfabrication.com (If you need your password to login, Click Here to input your email address, the password will be emailed to you whenever you need). 3. Find the previous order you need to re-order. Double click the previous order number come to the below page. 4. After filling the quantity, click the button Quote Now, and following the instruction to get the re-order quote. How to make sure to ship my PCBs with the shipping company I prefer? You need to do 3 steps. Step 2: Unselect the selection to authorize my company shipping department to use any other alternative shipping company to ship the orders for you (See the above example photo), and then click the generate quote button to get the official quote. How to build a combined quote with different type PCBs in it? If you have several different type PCBs need to quote, you can build the different type PCBs in ONE quote (Combined Quote) for easy ordering and shipping. To build a combined quote is very simple. After you add the 1st type PCB into the Quote Cart, DO NOT CLICK the green button to generate an official quote unless you have added all your different type PCBs into the quote cart already. If not yet, you can click "Back for Continue Shopping" button to add more different type PCBs into the Quote Cart. Please be advised that our Quote Cart can be loaded up to 12 different type PCBs before you click the green button to generate a quote for you. How may I get pricing on your web site for additional boards (20) with no changes after the first time 3 boards are made, before I have it made? If the first time order is for 3 boards, and then re-fabrication order is for 20 same boards, you can quote 3 boards first, and then quote 20 boards. Because 20 board order will be a re-fabrication order, the 1st Time Only NRE Fee will be $0.00 when you quote again after the 1st time board done . In this way you can know the price for 20 board fabrication fee and ship fee now (ignore the 1st Time Only NRE Fee as it will be no more there). Is there any easy way to know PCBfabrication.com prices? Yes, PCBfabrication.com was taken into PCBpriceScanner.com price scanning system. From that PCBpriceScanner.com, you can get our quote prices very easy with few PCB specifications, meanwhile it is great convenient for you to compare our prices with other PCB houses'.